I-Fest attendees enjoy the cultural booths at last year's festival. 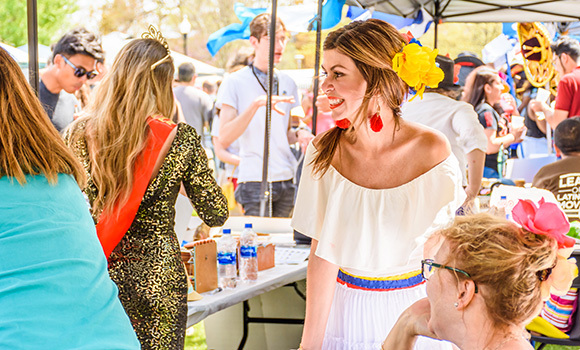 UNC Greensboro’s annual International Festival (I-Fest) returns to campus Saturday, April 6, from noon to 5 p.m.
More than 40 countries will be represented at this year’s event, which promotes cultural awareness, appreciation, and understanding through music, food, crafts, demonstrations, and entertainment. The festival will feature a constant rotation of performances from groups like UNCG Jalwa Bollywood, Earth Spirt Taiko, a Congolese choir, and the UNCG Middle Eastern Music Ensemble. Attendees have the opportunity to win prizes by traveling to different booths with their “passport.” Additionally, for the first time, I-Fest will include a Kids Zone with face painting, a green-screen photo booth, and crafts. A number of vendors will sell food, clothing, jewelry, and other items during the festival. The event, organized by UNCG’s International Programs Center, is free and open to the public and will be held on the Kaplan Commons in front of Elliott University Center. Parking on campus is also free during the event. Want to learn more? Visit the International Programs Center website.